Me: What are you talking about? We have bread, 3 kinds of deli sandwich meats, tuna, a crisper drawer full of vegetables, hamburger, chicken, cheddar cheese, noodles, sauces, 10 varieties of soup, and the ingredients to make a 14-topping salad. ST: Yeah, but we don't have anything to eat. Me: No, what you're saying is - we don't have corn dogs, macaroni and cheese, Twinkies, Pop Tarts, sugar cereal, Doritos, Hot Pockets, frozen pizza, pizza rolls, pizza burgers, pizza wheels, pizza bites, or pizza Pringles. Me: I see. Well then, I recommend you contact Unicef. I'm sure they'll be very sympathetic to your plight. Boy, does that sound familiar, and bring back memories!!!! OMG...you don't have pop tarts? How DO you survive over there? Ha ha! That sounds about right for a teenager! We have pop tarts for grandchildren that stop in. Dude! No Twinkies?!?! I am so calling the authorities on you! Totally cruel and unusual, I mean what kind of parent feeds their kids nutritious food these days? We need to plump them up for the aliens that are coming to bail us out! What normal, hungry teenager wants a salad? Even if it does have 14 toppings? I remember being that teenager! LOL You'll get payback when he has kids. Now I'm craving sugar cereal! mom - Except you had the magic "treat drawer" packed full with banana flips, jim jams, snowballs and donuts. We always had "food" at our house! ve - Apparently I run a small 3rd world country here. beetle - You know it. anon - So that's how you get them to visit eh? roger - I start working on defense case for social services right away. jd - I'll admit that kids don't do salads, but they sure as heck aren't starving around here, that's for sure. gette - Yeah, but he can buy his own junk food. elizabeth - That's got to be their biggest complaint. Although you'd think after 17 years of not having sugar cereal they'd stop asking for it. With two teen boys that is the topic of conversation every day! I think the boys think that if they hold the fridge door open long enough, some junk may just miraculously appear. OMG, I know that mantra all too well! Geez, I do it too, even after I just finished shopping. That sounds like me when I open the freezer, which is crammed full, and I can't figure out what to make for dinner. I just finished a very similar conversation with my brood, worried that we were running low on juice. I told them that we probably have enough food in the house to go an entire month without a single trip to the grocery. I said they might not like what we eat--but assured them we were not about to starve. Wait and see what happens to the dollar as we print all that money. They got you with the I.R.A. 's and next they will devalue the dollar. When do those crooks go to jail? Pizza fins? Seriously? *sigh* And to think I'm going to have to pay for these kids' medical bills someday. Oh jeez... I seriously had a woman on our street show up at my door one day saying her family was hungry and could I donate some food for their dinner. Now, I knew this woman. She and her husband both have disabilities. They had three small children to feed. I offered to give her some canned tuna. Some hamburger. Some pasta. Stuff like that. She said, "Oh, we don't really like that kind of stuff. Can't you just order us a pizza?" I said, "Sorry... come see me when you are really hungry. Like... you know... hungry enough to eat what my family eats!" Off she went to the next house. I'll bet she got her pizza! Sounds like said "starving teenager" just volunteered to do this week's grocery shopping! I keep a basket with bananas, oranges, and apples on the counter. It's easier than cooking. You know, I can totally sympathize with him. There are times where, right after grocery shopping, I will look in our pantry and think "we have nothing to eat" because even though our shelves are overflowing, none of it is what I really want. I'm not sure any of those things count as food. windyridge - Hey why not? It worked that way on the Jetsons and on Star Trek. Your kids are just ahead of their time. maureen- I always want Pringles. But I had to give up junk food long ago. angela - That's when it's the worst. You're tired from shopping and really don't feel like "making" something. Bleh. ed - Yeah, the kids are in real danger of starving. It's not like we're down to our last pound of rice. bill - You gotta pay attention around here. I move pretty quickly you know. michelle - Makes perfect sense to me. 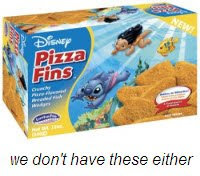 You have pizza and... uh, fins. Get it? teri - Wow, talk about beggers and choosers. Literally! curtis - Sorry... that would NOT be a good idea. He would come home with every single thing I said we didn't have! rick - You're not a sketch artist by chance are you? jacki - I agree. At times it would be fun to just pig out on junk food. Unfortunately, it would be the only thing they would eat if we had it. yello - I hope you're talking about my 2nd list in that post. I am definitely storing away that answer for my kids. Let's see, it's 9:53 am now. I'll pobably use it in the next 2.3 hours.